‘These ukulele bands have yearly conferences and competitions,’ whispered the friend sitting next to me. I was mildly surprised, being ignorant. ‘We are all so happy playing and singing,’ began the group leader, the woman on the left. ‘You must be happy with us.’ Isn’t the USA dedicated to ‘The Pursuit of Happiness’? Aren’t you wished, ‘Have a good day’? 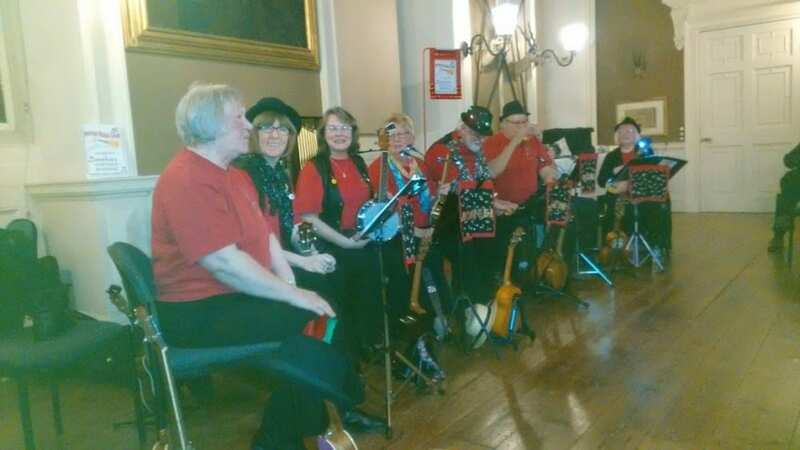 A feeling surged into my mind; I wanted to decide myself whether to have a good day or be happy listening to a band of tinny ukuleles, however jolly the players were. So they started singing and twanging away. I resigned myself, unsuccessfully trying to stifle my deep-seated dislike of Country and Western. My father sowed his wild oats in the USA Midwest and sang these songs. Worse still, he carted my sister and me off to such musicals as ‘Annie Get Your Gun’ (though we were dragged out of the theatre when they started singing ‘Uncle Bill lived on the Hill with someone he ain’t married…’! Our mother wasn’t sure quite what was happening, but my sister learnt how to play the songs on the piano.) It took me some time to realise that I disliked Country and Western and birdsong precisely because my father was crazy about both. And if I misbehaved, the rebuke would be, ‘If you were a boy, then you wouldn’t do that,’ or a variation of the same. He was a loving father, but desperately disappointed that his second and last child was another girl. Back to the ukuleles and the singing which many around me were happily joining in. I sat and smiled and started humming along – what else was there to do? Physically trapped in the spacious great hall of a lovely country house, I looked at the portraits and my mind wandered. Back to a university vacation when I met a young Austrian student. She couldn’t speak English and I couldn’t speak German, so we communicated in French. She invited me to visit her home above Salzburg. I was keen to go there, not knowing what to expect. We took a bus through green upland pastures past a dew pond high up, finally to reach a remote timber dwelling. Her home. We gathered for an evening meal of lamb, fresh vegetable, crunchy little pears and apples and an evening’s entertainment by lamp and candlelight – no electricity, a battery radio and no television, then in its infancy. My father had a pleasant tenor voice and, though he couldn’t read music, he told us he that in his youth he was in demand for such impromptu concerts. Neighbours assembled each with an instrument. The usual tuning cacophony. Then the concert for their guest, the traveller from afar – me – began, but only after a voice piped up that they would be playing music by, ‘our local lad’ – Mozart. Never a better, warmer or – happier – welcome!